The clinical applications of genomic technologies are vast and offer opportunities to improve healthcare across the breadth of medical specialties like gene discovery and diagnosis of rare monogenic disorders, identification and diagnosis of genetic factors contributing to common disease, pharmacogenetics and targeted therapy, prenatal diagnosis and testing, infectious diseases, personalized medicine, etc. CRISPR is the newest and efficient with accurate method to edit a cell’s genome. However, as it opens up a myriad of wonderful opportunities as well as frightening ethical challenges in healthcare, there are already numerous start-ups experimenting with it and in 2016, CRISPR even got a green light for clinical trials from the US National Institutes of Health. In the future, it might become the ultimate weapon against cancer, malaria or genetic disorders. Goldstein Research analyst forecast the genomics market size is set to reach USD 24.5 billion by 2025, at a CAGR of 11.2% over the forecast years. Intensifying level of competition in the global healthcare industry, increased demand for genetically modified animals and plants and the constantly reducing prices of genetic procedures are expected to lead to vast traction to the global genomics market in the future. The report covers the present ground scenario and the future growth prospects of the genomics market for 2017-2025 along with the data of installed units, consumables and services in medical facilities worldwide. We calculated the market size and revenue share on the basis of revenue generated from major players across the globe. The genomics market is forecasted on the basis of revenue analysis, product benchmarking and strategic developments of key market players. The report also includes micro and macro factors essential for the existing market players and new entrants along with detailed value chain analysis. Based on application, diagnostics application market dominated the overall genomics market in terms of market share in 2017 at over 32.5% due to accuracy of gene-based diagnostics of variable diseases. Personalized medicine market is expected to grow at the highest CAGR of 11.42% during the forecast period due to profound focus of creating medicines for cancer patients where effectiveness has been proved to be higher as compared to other therapies. Global Genomics Market Outlook 2017-2025, has been prepared based on an in-depth market analysis from industry experts. The report covers the competitive landscape and current position of major players in the global Genomics market. The report also includes porter’s five force model, SWOT analysis, company profiling, business strategies of market players and their business models. Global Genomics market report also recognizes value chain analysis to understand the cost differentiation to provide competitive advantage to the existing and new entry players. 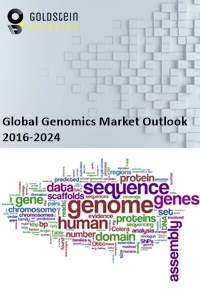 Our global Genomics market report comprises of the following companies as the key players: Bayer AG, Affymetrix Inc., Agilent Technologies, Inc., Genomatix Software Inc., Navigenics, Inc., Roche Diagnostics, Myriad Genetics, Inc., QIAGEN, Inc., Illumina, Inc., GE Healthcare, Thermo Fisher Scientific, Eurofins Scientific, BGI, Bio-Rad Laboratories, Oxford Nanopore Technologies, Pacific Biosciences of California, and Eppendorf. Other key vendors are: 23andme, Futura Genetics, Veritas Genetics, Counsyl, Verge Genomics, Deep Genomics, IBM Watson for Genomics, Verily Life Sciences, DeCODE, Foundation Medicine, Rosetta Genomics, Color Genomics, Quest Diagnostics, National Geographic’s ancestry test, Ancestry, Illumina, Nanopore Technologies, Edico Genome, BGI, Intellia Therapeutics, Editas Medicine, CRISPR Therapeutics and MyDNA. According to the report, major driving factor is the adoption of genome editing/genome engineering in genomics which are used for cell line engineering, genetic engineering, diagnostics and therapeutics. For instance, genome editing is used in target gene modification in plants and eradication of vector borne diseases such as yellow fever, dengue, Zika, West Nile, Schistomiasis, Leishmaniasis and Lymes disease which is the segment that is attracting major portion of investments in agricultural and healthcare sector. Further, the report states the biggest challenge is the complex nature of the drugs coupled with high development costs, sub-optimal development framework and inter-patient variability of effects contributing to potential barriers that are integrating genomics into underserved medical settings. Based on geography, Europe accounted for the largest share of the overall genomics market in 2017 at over 37.25%. While APAC is expected to witness the most significant development owing to strengthening economies of developing countries such as India and China and the increased focus of the respective governments on encouraging research in the field of genomics, in addition, China hosts the world’s largest genomic research institute, the Beijing Genomics Institute in order to sustain the growth of genomics market. North America genomics market will grow at the substantial rate due to the ample amount of funds and presence of companies undertaking research in the field of genomics.